It was 70 and sunny, I actually got some sunburn! Summer, I'm so ready for you.. I OF COURSE brought my sewing machine and some projects to work on.. 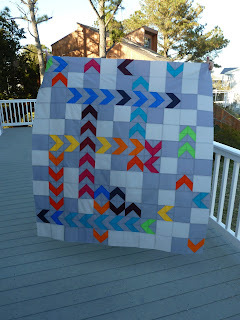 Completed my Chasing Chevrons quilt top! the wind was not cooperating with me.. This is also on my 2nd quarter FAL post, if you haven't linked up yet, get on it! the quilt top is awesome Jennifer! I love the quilt! Enjoy your break. Great pattern, I've not seen it before. Great movement. Beuatiful quilt top. Sounds like a wonderful Easter holiday!! Looks great, Jennifer! And 70 degrees and the beach sounds perfect right now! I agree the solids are wonderful with this pattern, great quilt! Great quilt top! oh my I'm ready for summer too! EEEE!!! I love it, love it, love it! Love the quilt. Love that you find time to create such wonderful things while vacationing. I must try that sometime. What a great pattern! I don't know how I haven't seen that one before. Wow, so pretty. I love the pattern! I did this QAL and need to finish my backing. Love your solids and the two colors of background. Looks great!